Tom Jewett, Clyde, Ohio, would have us swindling poor fankind Dear Harold: Your Fantasy Aspects reprint-zine sounds okay. ...Will nfff'ers get copies at a lower price than non-same? If so, I'll rejoin quick... ...Howabout a reprint articule on Lovecraft? Lotsa us more or less new fans never read about him during his heighth (sic) of popularity a few years ago. And the pre-Campbell ASF's which, I've heard hit a new low in its day. And articles on stf zines not being published... Besides you receiving a batch of a free zines and poor fans a lot of stuff they're too stingy to buy originally, I can find no sane reason why you shouldn't have good luck in this venture. Regards, Tom Helpful Kay-Mar Carlson of Moorhead Minn., one of the kindliest guys in the biz comes fort mit-- Dear harold: I've been wondering how the new fanzine digest is progressing since the directors voted for it. I am sending you a copy of my report sheet to the officers of NFFF, so you can see what is coming up. Can I be of any service in your work? Hope you are interested enough in this to really make something of it this year. Foreward, with N.F.F.F. Sincerely, Martin Jack Riggs, Berkeley, Calif., one of the top fan fantasy fiction writers has these kind words -- Dear Harold: Certainly you may reprint those items you mentioned and anything else from the past issues (of Lethe) that you want...If you are able to continue fan pubbing, I enjoyed Atres Artes myself. Well, here's to luck whatever. Jack The N.F.F.F.? WHY JOIN AND SUPPORT THE NFFF? BECAUSE - the N3f is the only NATIONAL organization devoted exclusively to your interest in fantasy. 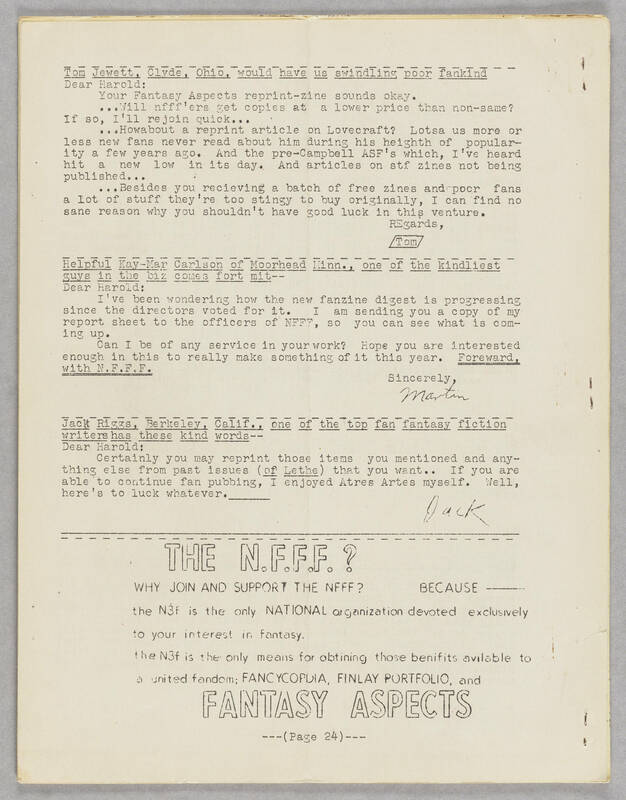 the N3f is the only means for obtaining those benefits available to a united fandom; FANCYCOPDIA, FINLAY PORTFOLIO, and FANTASY ASPECTS.